When it comes to cooking food for your family, you choose the best way of making it, and the best oil to cook with. Refined Rice Bran oil is considered as the world’s healthiest oil. The absence of Trans Fat and the presence of a wealthy amount of antioxidants, vitamin E complex, and other micronutrients make refined rice bran oil the best for human consumption. Another advantage that refined rice bran oil carries with it is that, it is hypoallergenic – the perfect choice for those who seem allergic to other cooking oils. Strongly matching the American Heart Association (AHA) recommendations, it is the most balanced oil that can serve multiple purposes. Wherevercooking oil is used, Rice Bran Oil is an ideal replacement for it. From deep frying, to topping on salads – in a healthy way –Rice Bran Oil adds the perfect flavor to it, along with making it light and easy to stomach. Due to its low viscosity, the absorption of oil drops, resulting in an overall lesser amount of calories. This makes it especially useful for those who suffer from cholesterol problems, and cardiovascular diseases. Having the knowledge of betterment of health, yet, the vast choices provided by the market make it difficult for people to choose the most desirable option. 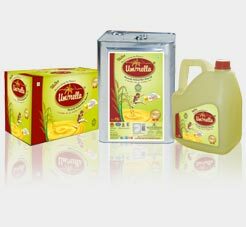 But here’s the experience speaking – Umbrella Refined Rice Bran Oil is being presented to you, assuring its guaranteed quality, as the best caretaker of yours and your family’s health. It is widely used, in a number of countries like, China, India, Korea, Japan, and Indonesia. Umbrella Refined Rice Bran Oil has been tested for the presence of all essential nutrients, and is 100% pure oil.The Tocotrienol in this oil contains a 1200-2000 ppm of ORYZANOL. It is amazingly helpful for lowering cholesterol and cardiovascular diseases. It has also earned the fame due to its ability to enhance the flavor of the food cooked in it.